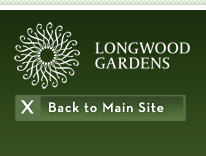 Longwood's green wall, designed by British landscape architect Kim Wilkie, is 14 feet tall and encompasses a surface area of over 4,000 square feet (372 square m) down a long, curving corridor. 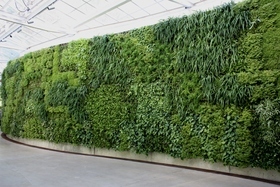 It features a paneled wall system, constructed of 3600 interlocking stainless, 12" x12" (30 x 30 cm) steel panels, to support about 47,000 plants. Each panel is filled with a soil-less mat made of composted bark and coconut fiber. 13 small plant plugs are planted in each panel and are watered by a drip irrigation system. Below are some of the ferns and foliage plants that you will see in the wall.